North Woodstock, NH: The New Hampshire Maple Producers Association (NHMPA) is proud to announce that the winner of this year’s Lawrence A. Carlisle Memorial Trophy for the best NH-made maple syrup is Atkins Family Sugarhouse in Washington, NH. After coming in second place in last year’s competition, Shawn Atkins of Atkins Family Sugarhouse takes their syrup to the next level to reach the top prize. In preparation for the upcoming maple sugaring season, NH maple producers from across the state come together for the annual NHMPA Winter Meeting. This meeting also includes the awarding the prize for best maple syrup of the previous season. Each year, the NHMPA recognizes the top five producers. 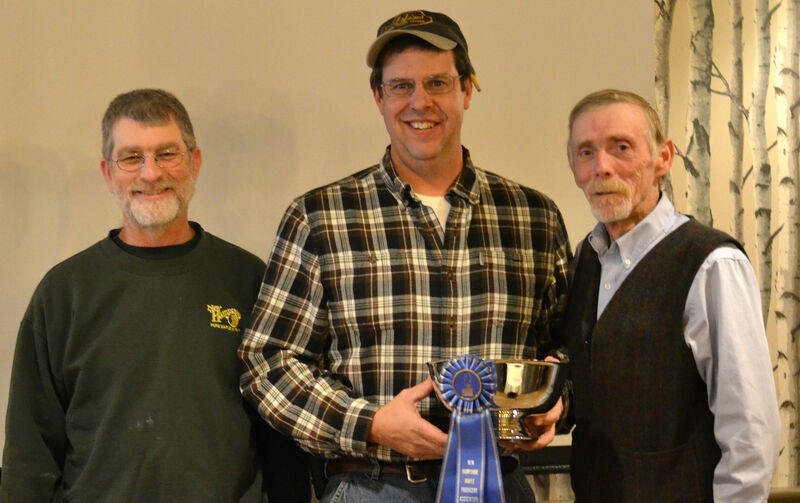 This year, Second Place went to Charlie Hunt of Hunt’s Sugar House in Hillsboro, NH; Third Place to the Pat & Miranda Colby of Maple Ridge Sugar House in Loudon, NH; Fourth Place to Matras Family Farm in Pittsfield, NH and Fifth Place to the Larry and Jeff Moore of Windswept Maples in Loudon, NH. Commonly referred to as the Carlisle Award, the award is presented annually by the NHMPA for excellence in production of maple syrup. Entries are judged by density, clarity and flavor. Any of the 350-plus members can submit an entry. The award is named for Lawrence A. Carlisle, a commissioner of Agriculture in the 1920s and 1930s, devoted to the development of the maple industry in New Hampshire and best known for introducing the maple grading system. About the New Hampshire Maple Producers Association, Inc: The New Hampshire Maple Producers Association, Inc. is a non-profit trade association dedicated to promoting the high quality of New Hampshire’s maple tradition. The NHMPA organizes several public events throughout the year including Maple Weekend on March 24-25, 2018, when all our sugar houses are open to the public, NH Maple Sugaring Month, the Felker Prize and the tapping of the first maple by the governor. Learn more at www.nhmapleproducers.com. ← 12″ to 25″ of snowfall in Mt Washington Valley over the past week!